Please stop by and vote for our blog while you are there..
We got these Mexican wrestling masks at the Rose Bowl Flea Market this summer. I think it is a match-up between Mil Mascaras vs. Rey Misterio, but I may have my wrestlers mixed up!!! Mario even got into the action... see left sidebar!! They walked over to the day care next to school and greeted the younguns and then got back into their ride to visit the other schools in town. Santa keeps a pretty tight schedule. We were going to go back to our favorite desert spot, but then we decided to go to Catalina Island. We have been in California for 5 years and have never been there. We have heard many speak well of the island and Avalon. So 'L' made the arrangements and off we went on the Catalina Flyer. One hour and fifteen minutes later we descended on Catalina Island and the town of Avalon. It was the most wonderful, relaxing 4 days that we have spent in a long while. There are only a small number of cars allowed on the island and 1 golf cart per address. You can walk to so much in town and bike ride and hike. There is something for everyone. On our next trip we are going to take more tours, we want to take a tour inland to see the bison that were brought onto the island to film a movie and were left after filming. Today I opened an online store at Cafepress!!! 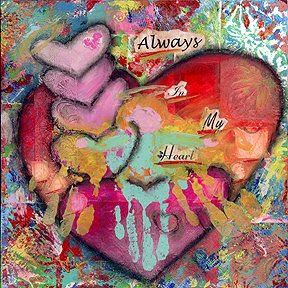 You can now purchase my collage images on various products. I am so excited. I only have these 2 images uploaded so far, but I will be adding more soon. 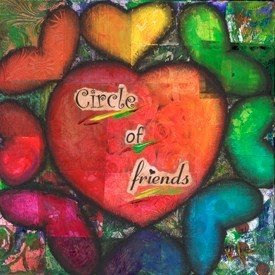 Circle of Friends is one of my personal favorites. I was thinking of my closest friends, this represents how they have surrounded me throughout my life. I am sure everyone has their own special circle. 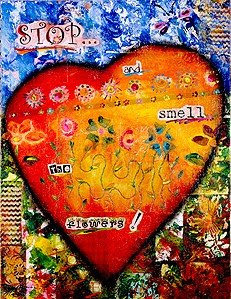 This is Stop and Smell the Flowers II. 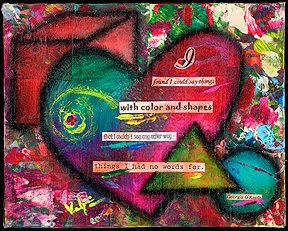 It was the piece that I was commissioned to create and was my number one lesson learned from my cancer experience. We all need to take that moment to stop and enjoy the simple things in life (at this time of year especially). I finally have some Giclees of my work which I will be selling in my etsy shop after Thanksgiving. Speaking of Thanksgiving, I wish a very happy and healthy day to everyone. My sister sent this video to me and I love it… it makes me want a hot dog. We grew up near Buffalo and Ted’s is a mainstay. Whenever the weather would start to get nice you could be sure that the line would be outside the door with people having a hankering for Ted’s. When I was in school in NYC I would eat the street dogs with mustard and sauerkraut, they were okay but like the video…they do not compare. 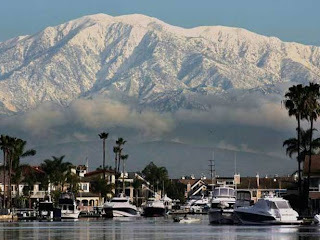 In California – forget it… there is nothing that compares (at least not that I have had yet). Usually when we go back to visit or a visitor comes out here they bring a 5lb. package of Sahlen’s dogs and we freeze them. Lastly, Beef on Weck (Kummelweck). Not my favorite as the weck is a bit salty, but there really is nothing like a good roast beef sandwich – I just ask for a Kaiser roll instead. I think I may place an order for some of my favorites…. I was contacted last month about participating in an interview with my daughter for a news piece that World Health News Today wanted to film on Kids Konnected. The reporter and photographer came to my house and spent about 1 ½ hours filming me and then they attended a Kids Konnected meeting to film my daughter and the teen group. It is always interesting to me to see how much is filmed and what remains on the editing floor. I hope it highlights just how important Kids Konnected has been in our lives since my diagnosis. Sometimes it is hard to be at the meetings and see another new family come in that has been affected by cancer. At least there is a place for support and understanding, for the kids, for the parents, but mostly for the kids. Sometimes kids do not want other people to know their parent has cancer. At Kids Konnected they can talk about it because everyone there has been touched by cancer. I wish that kids never had to worry about one or sometimes both of their parents having to fight cancer or dying from cancer, but for now that wish is just that …. a wish. Until we have a cure Kids Konnected is a place for the affected families to seek help and support. Friday night I attended the annual Girls Night Out Fundraiser for Art and Creativity for Healing. It is usually held at an interesting venue with music, dinner, drinks etc. As everyone knows this year has been especially hard, but even more so for many non-profit organizations. Being the creative organization that it is – my goodness Creativity is its middle name - it was changed up a bit this year. One of the board members offered to host the event at her fabulous home. The event was scaled down and 90 women were in attendance. Each attendee bought their ticket and also brought an item to be auctioned during the event. We had unbelievable items to bid on during the silent auction - jewelry, home decorations, artwork, spa treatments, teeth whitening – (which I lost out on at the last minute). There was also a live auction for some of the larger donated items and a scholarship pledge to fund various programs for children. Our bartenders for the evening were the male board members. Each lady was served a delicious “boxed” dinner and we had our choice of venues to partake the meal. The sleek white and stainless kitchen, the table for 14 in the dining room, the comfortable sectional in the family room or the relaxing patio listening to the ocean waves crash below. The event was much more low key than in past years but was much more intimate. You felt like you were in a gallery for visual art as well as architecture and furniture design. If you have teens in your home, ask them if they know this person. They most likely will say “yes”. If they watch Life of Ryan on MTV they will realize that this is one of Ryan’s best friends Mitch. Mitch is a very polite and gracious young man who said “yes” when I asked if I could take a picture of him for my daughter. He said we both should be in the picture to which I replied “I do not really think she wants me in the picture”. We took 2 - one with and one without me!! I asked if he minded if I put him on my blog and he said “you have a myspace?” I said no, not yet, just a blog!! The evening was a lot of fun and we raised money for a good cause. If anyone would like to provide a scholarship for any of the above programs head on over to Art and Creativity for Healing, click on Donate to ACFH and select the scholarship type that you would like to fund. “Belly of the Whale”, by Linda Merlino is the story of a day in the life of a mother of 4, Hudson Catalina, battling breast cancer. It is set in Gloucester, Massachusetts during a Nor’easter blizzard that has not been experienced in years. We follow Hudson through her morning of frustration with the disease and all that it entails. We travel on her road trip for chemo with her best friend and sister-in-law, Kathy and examine her relationships with the various people in her life. The story takes a turn for the worse, as the storm does, when her intentions to plan for the future of her daughter land her in Whales Market. In Whales Market we meet characters that many of us have met in our own lives. Ruby, who guided by her strong faith provides wisdom. Willy Wu, a “Lamb of the Lord”, special in his own way. Buddy Baker, a person so damaged by the experiences and events that have occurred in his life that he forever changes those he unleashes his anger and wrath upon. I personally had a difficult time reading part I of the story. I am a 30 month breast cancer survivor and found myself comparing and contrasting my experiences to Hudson Catalina. Hudson speaks of her feelings as she looks in the mirror, “I paused and saw the sunken eyes and sharp angles of my thinned face traced atop a neck so narrow that it disappeared into the collar of my robe.” That sentence alone took me back to the same face that I stared at in shock and disbelief when I was a cancer patient. I kept reading and started to enjoy the story more as it developed. As I read, I tried not to analyze Hudson but just experience her life. My 4 month check-up with my oncologist was scheduled at the end of September. The day before the appointment the office called to cancel and I had to reschedule for yesterday. Even though I am feeling good there is always a certain amount of anxiety that pops up prior to any doctor's appointment. When it was cancelled, it was a short relief until this week. The anxiety builds until the appointment. It was a pretty easy one though - 1 hour flat - unbelieveable!! Weigh -in, Blood work, chat with the nurse - review medicine and symptoms. He performs my physical exam and asks about the kids, etc. He says my blood work looks good. He tells me to keep my stress level down - okay I need to work on that one. We talk about the Komen race and he mentions how powerful it was. I spoke of how encouraging it was to sit by a woman wearing 20 strands of beads. We both agree we have come so far in this cancer fight, but we have so far to go. He talks about 3 new drugs on the cusp of being approved. I show him the MotherswithCancer flyer and talk about our site, he thinks it is wonderful and asks me to give it to the nurses to post. He will see me in February after the San Antonio Conference. I always thank him and tell him to thank his wife for giving up so much of him while he is saving so many lives. I love my doctor... I love his bedside manner... I love his nurses... I am blessed to be one of his patients. I say hi to all of the patients getting an infusion on my way back to the nurses station. I remember all to clearly the 8 times I sat in those exact chairs. I catch up with the other nurses. I get a flu shot. My anxiety is relieved for another 4 months... I treat myself to a Jamba Juice... It was a GREAT day. This is what we saw today from our front yard when we got home from school. The fire was burning in the nearby canyon but they evacuated the 3rd phase of our development. They told us to have our things packed. If the wind were to shift slightly we would have to evacuate quickly. Luckily the wind shifted the other way so we did not have to evacuate. About 50 acres burned in 2 hours. Thankfully no one got hurt in this fire and only part of one home was damaged. The firemen told my husband that if this reservoir was not so close to the fire it would have gotten out of control and many homes would have been lost. We saw the CSI's walking around so we will find out if it was arson. Last night my daughter and I attended the 10th Annual Founders Gala for Kids Konnected. It was held at the Marconi Automotive Museum in Tustin, CA. I wanted to give back to this organization that helped us so much throughout my cancer experience and continues to help us emotionally move forward. I created this original collage that I felt was significant to Kids Konnected and the children that they assist.